Maite: a Basque name meaning "one who is loved." The word is one I'm familiar with as the name of my best friend, a lady whose family is from the Basque, a region in Northern Spain known for being a culinary Mecca. 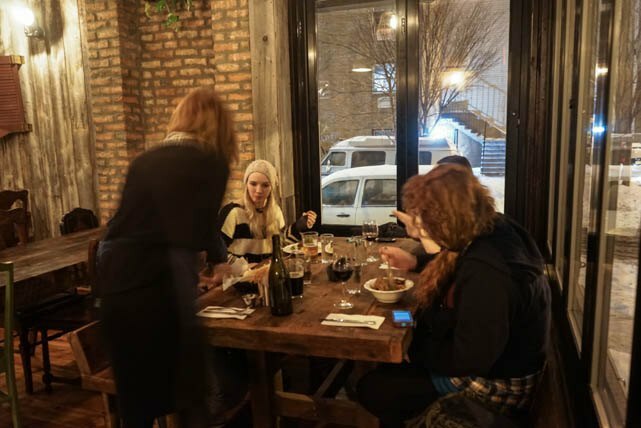 Now, the name has a whole new significance, and belly-warming context: it's the name of a fantastic new farm-to-table restaurant on the corner of Suydam St. and Central Ave.
Its cross-cultural cuisine is rooted in Basque flavors with a Colombia flair, wrapped up with a major Italian influence. On the first Sunday after their official opening I stopped by to try some signatures dishes and cocktails in the cozy, rustic restaurant, including Empanadas, Parpadelle, and Black Squid. Upon arrival, a small, hand-painted sign announced itself in a rustic font: Maite. 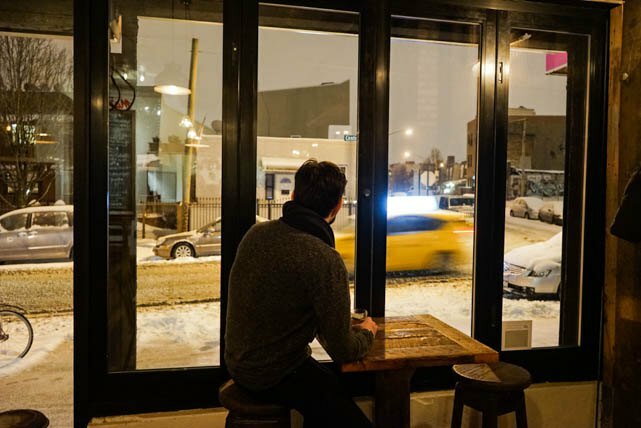 Inside, large windows provide a viewpoint for passing traffic and icy flutters while reclaimed wooden walls and minimal industrial decor provide a cozy backdrop. 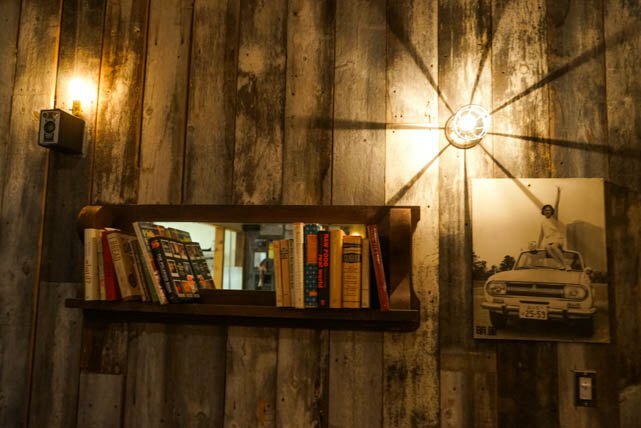 The decor and sparse tungsten lighting evokes a slight saloon feel, complete with "jailhouse" shutters and Edison bulbs. 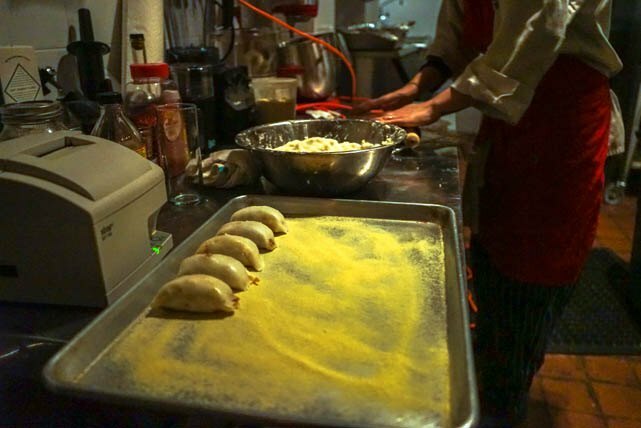 Chef Ella making Empanadas in the open kitchen. Co-owners Kano Mitchell and Ella Schmidt share a passion for good design, good food, and good friends, which is why the warm vibe of the restaurant, with large wooden tables, a sole chalkboard menu, and an open kitchen, feels so communal. 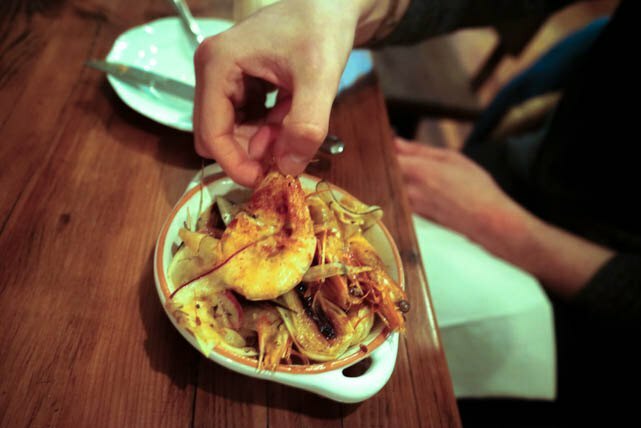 The menu reflects the same nature; built in the style of "pinchos," small smaller portions of delicate foods, similar to tapas, meant to be shared over drinks and laughs. 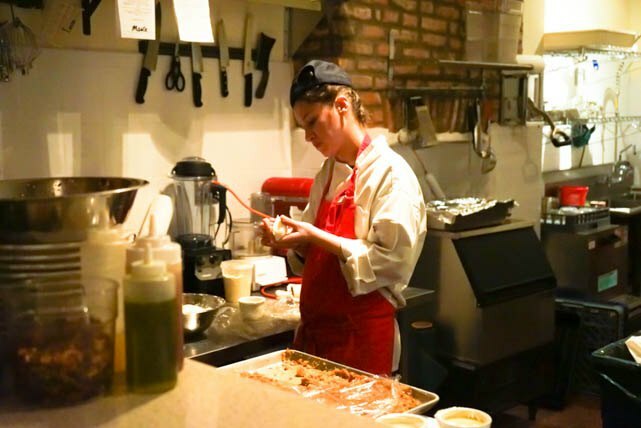 Ella, who is Colombian but whose mother is from Basque country, worked for years as a pasty chef at Manhattan's Italian hot spot Il Buco, says it was a dream come true to see Maite finally open after a year of work. 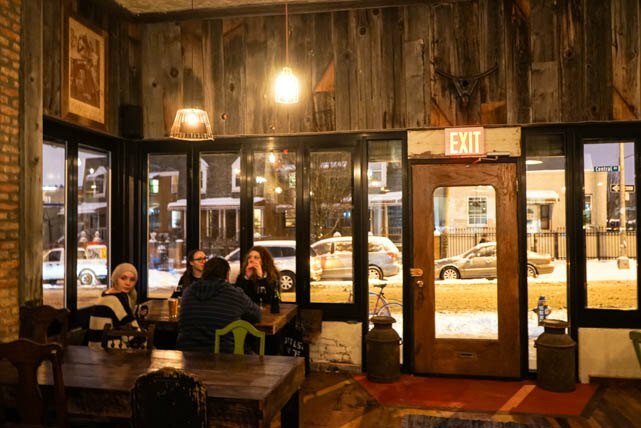 The restaurant fits well into the culinary-conscious food scene of Bushwick alongside other farm-to-fork establishments like Roberta's, Northeast Kingdom, and Dear Bushwick. 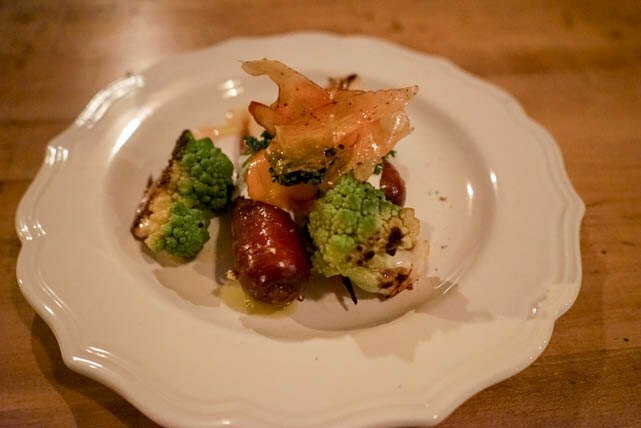 Maite sources its meats and produce from from farms in our area such as Lancaster Farms and the Fingerlakes; their menu is shaped completely around what they can get their hands on seasonally. 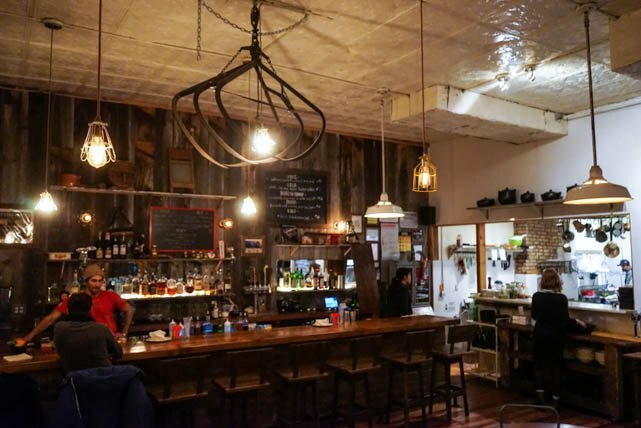 The huge, comfy bar is a great place to grab a seat, and resident bartender John Q, who's very passionate about the drink menu, had us feeling at home right away. 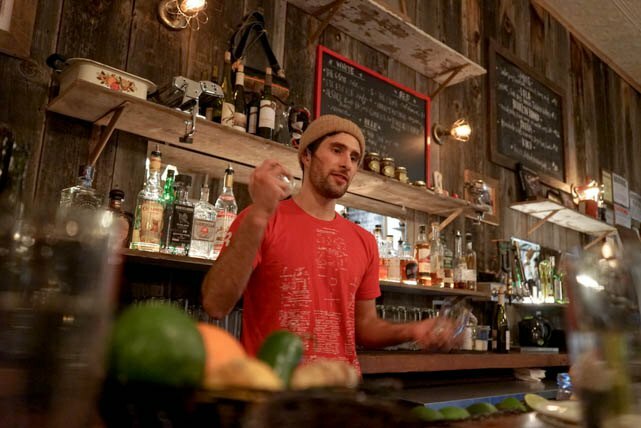 A member of Bushwick-based band Ososexy, a beatboxer extraordinaire, and resident DJ, he's not only great to chat up about the cocktail menu, but also knowledgeable about the neighborhood. Our favorite drinks? 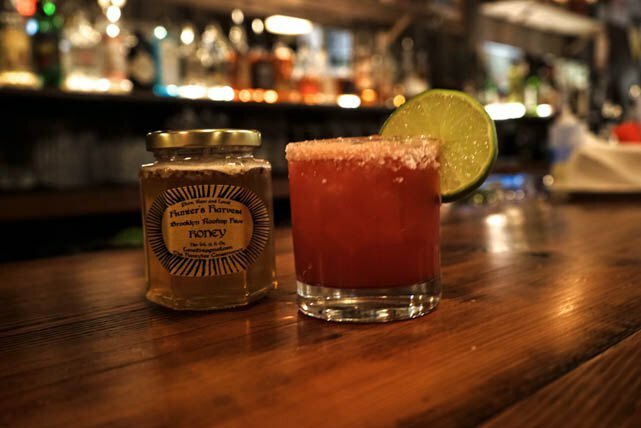 The Brooklyn Bound ($12), made with local honey grown on the Kano and Ella's roof in Williamsburg, and the signature Maite, a kind of spicy, gingery mojito. OH! And don't forget to order a toddy, Anita ($11) made with of Agardiete (or just a straight up shot), a Colombia spirit that's not served anywhere else in Brooklyn (to our knowledge). There are also a good variety of beers on draft, including John Q's choice- the deep, smoky Joe Mama's Milk Stout, plus a bunch of crisp California wines ($8-13). And though the drinks were excellent, the food was the biggest winner. A perfect amalgamation of Ella's cultural and culinary background, there's something unique for everyone. 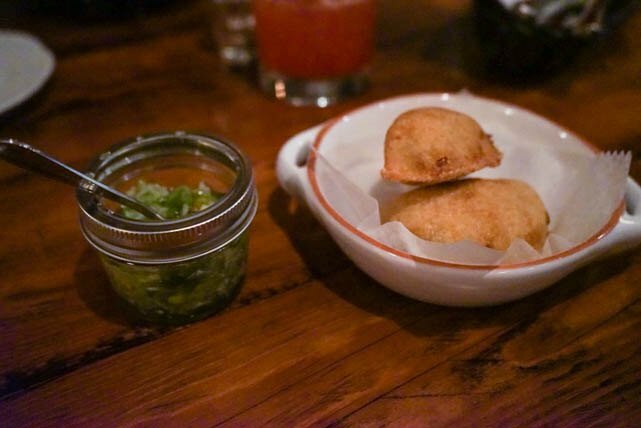 Be sure to get an order of Empanaditas ($6) for a snack or a starter for the delectable baked dough pockets oozing with roasted chicken and potato that comes with aji, a tangy Colombian salsa made of scallions and lime. 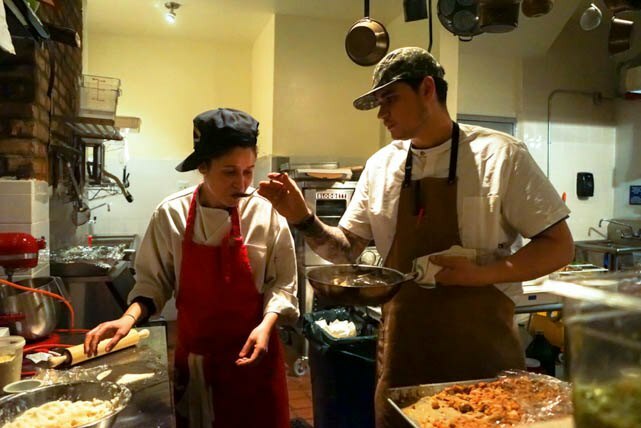 Sous chef Alex German gives Ella a taste. 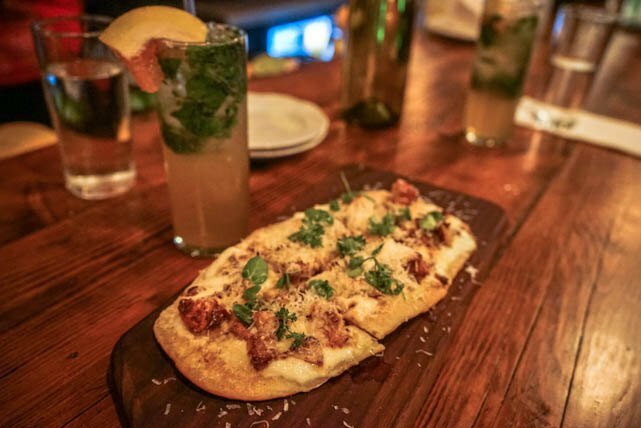 Of the main/stack courses, The Coca ($14), is a wonderful Spanish-style pizzetta, made with smoky chorizo, kolhrabi, sweet caramelized onions, and a creamy craime fraiche. With a stuff, crunchy crust and hearty toppings, it was also a perfect dish to share. 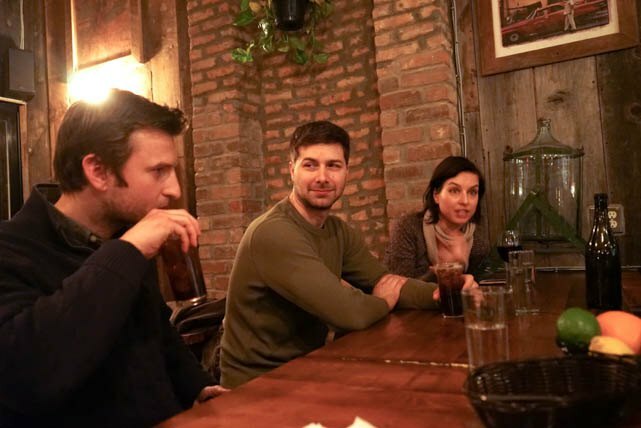 Upon our first bites of the savory pie, our barmate, a costruction worker named Eric, looked over and remarked, "this place is going to be bad for me" with a grin. An order of the head-on Shrimp in tangy, unexpectedly tasty Apple Cider Vinagrette with radishes and braised onions ($13). Farm Fresh Veggies Small Plate ($8) makes the perfect side or healthy starter--al dente baby carrots, romanesco and ricotta played nicely together. 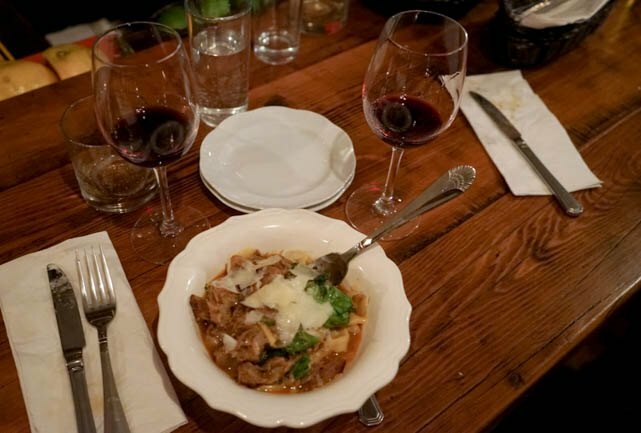 The Pork Rib & Escarole Parpadelle ($15) was made of of rich, pulled meat, and tender, house-made egg noodles. 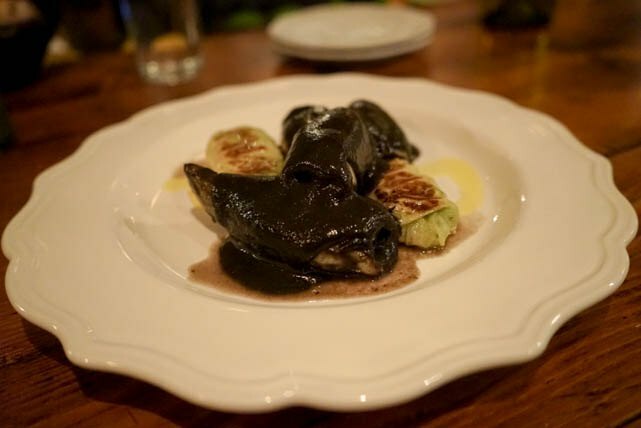 Adventurous eaters should try the whole Black Squid with Cabbage Risotto ($15), whose black sauce was rich, salty, and almost mole-like. The hearty rice croquettes brought to mind Golubtsi- Russian cabbage rolls with a similar texture. Although three whole squids is probably too much for someone who isn't crazy about squid (see: me), it was a great dish to try among two or three. After sampling so many decadent dishes I had to turn down dessert to avoid a food coma, but will be back very soon to try the cream caramel sorel (as well as the Burger and Arepa, which looked amazing). 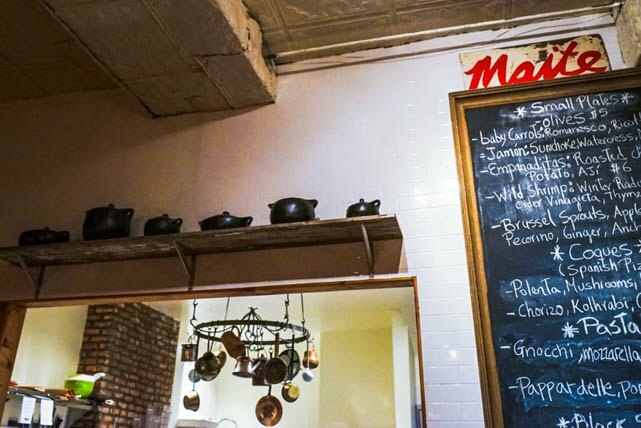 Maite is the perfect place to bring a friend, or a date, get cozy, and share an evening. One thing is for sure. If Maite is "one who is loved," both I and the Yelp reviewers agree-- this place is one deserving of that affection. 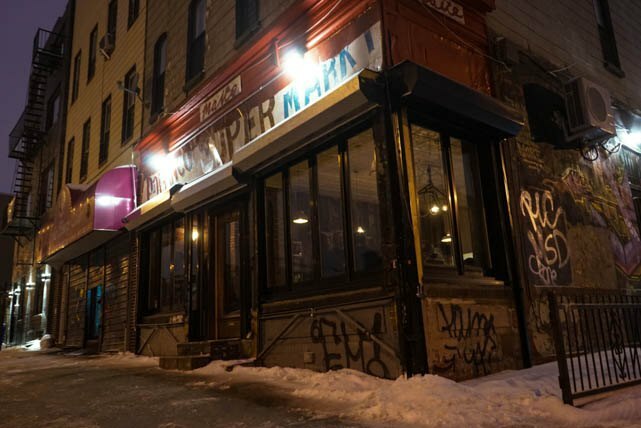 Maite is located at 159 Central Ave. Open weeknights 5-11PM, weekends 5PM-1AM. Dinner only for now; keep posted for brunch in the Springtime.